In 2016, nearly 58% of ballots cast in the general election were VBM ballots–up from 27% in 2002. Encouraged by this rising usage, some counties are now planning to expand access to VBM balloting, and are making plans to switch to a new Vote Center Model. This new model provides that all registered voters in a participating county be mailed a VBM ballot while, at the same time, also replacing neighborhood polling places with Voter Centers. The CCEP’s new statewide survey research examines California voters' use of VBM and their perceptions of the Vote Center Model. The findings identify some of the opportunities and challenges that may arise when switching to a Vote Center Model, particularly for electorally underrepresented populations. This research will help inform implementation strategies by election officials and community leaders as they work together in their planning for a new election model. To better understand the experiences that California voters have with the different available methods for casting a ballot, the CCEP recently conducted a multi-method research study using statewide survey and focus groups entitled The California Voter Experience Study. We gathered information from a diverse range of voters to understand how different populations in our state are experiencing the current Vote-by-Mail system and polling places, and how they perceive the proposed changes in California’s voting system currently being considered by decision-makers in our state. To better understand California voters' experiences with the different available methods of casting a ballot, the CCEP conducted a multi-method research study entitled The California Voter Experience Study. In this first in a series of research briefs examining the California voter experience, we discuss differences in how underrepresented groups view using polling places vs. Vote-by-Mail, as well as their perspectives on the possible implementation of a new vote center model in California. 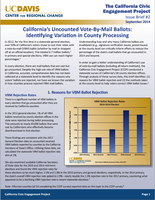 This brief examines the reasons for Vote-by-Mail (VBM) ballot rejection in the state of California and the methods taken at the county level to help voters correct VBM ballot issues. Utilizing detailed voter registration data from California’s county election offices, we analyze the state’s rejected by age, language preference and military status for the 2012 general election. Key findings include the following: Youth and non-English-language voters are more likely to experience VBM ballot rejection. Missing signatures are a major reason non-English ballots are rejected. Military and overseas voters experience a higher likelihood that their VBM ballots will go uncounted. Votes by mail surpassed 50 percent of votes cast in a general election in California for the first time in 2012. In the June 2014 primary, nearly 70% of all voters used Vote-by-Mail ballots. In every election, there are mail ballots that are cast but go uncounted, leaving voters disenfranchised. Understanding how and why many California ballots are invalidated (e.g., signature verification issues, postal issues) at the county level can critically inform efforts to reduce the percentage of the state's mail ballots that go uncounted in November 2014 and beyond. About half of California's statewide ballots now cast are vote-by-mail. This is the first comprehensive analysis of the changing demographic composition of California's Vote-by-Mail voters over the past decade, providing critical insight into how this voting procedure has impacted the state's electorate. Our main findings include: 1) Disparities in Vote-by-Mail use exist by age, race and ethnicity. There is a large and growing gap between Latino and Asian-American groups. 2) Asian-American voters favored voting by mail more than the general population did, while Latinos — the fastest-growing segment of voters — still prefer to go to the polls. In 2012, 58 percent of Asian-American voters used mail ballots, compared to only 37 percent of Latino voters. 3) Young voters, age 18-23, voted by mail the least of all age groups, at 39 percent.